Stellaris, excellent though it is, shows only a love of science fiction. 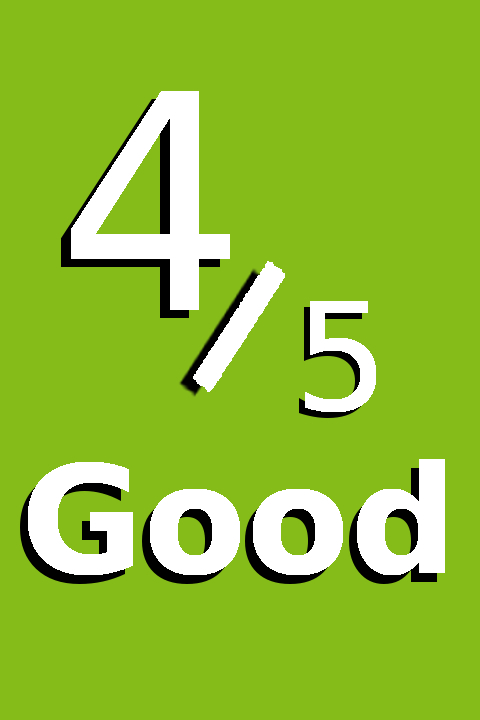 Being a Paradox grand strategy game, with 4X elements, science fiction is merely its wrapping. 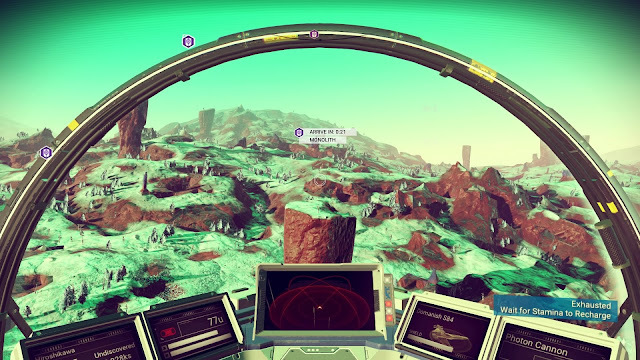 No Man’s Sky on the other hand is a piece of science fiction, realised in ways only games are currently capable of. My appreciation of the science fiction literary genre stems from novelist of today primarily, though I am actively working to broaden that. Whenever I foray into the classics, I invariably end up grinning in delight at all the ways, subtle or otherwise, that today’s writers pluck details and themes from yesteryears. With that in mind, I would liken No Man’s Sky most closely to the work of Alastair Reynolds. Note that I did not say story, or aesthetic, but the game itself. With very few exceptions, it is not the characters, nor the plot that has kept me reading Reynolds’ work, but his worlds and the way he conveys them. The same is true of No Man’s Sky; I don’t sit for hours a day to nibble at its narrative, nor because I enjoy its survival mechanics. 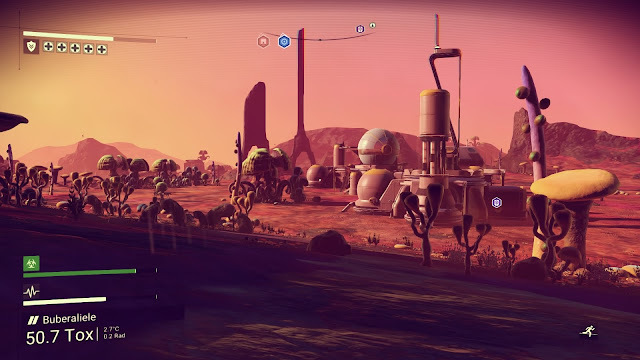 Again, it’s the world, and the way Hello Games shares it. Classic science fiction, particularly the hard kind that Alastair Reynolds pens, dives into the merciless depths of astronomy and physics whenever possible – and in my experience, that’s more paragraphs than not. When this happens, I rarely understand what I’m reading. I may understand the effect, but rarely even a sliver of the science. Such sections, perhaps even the majority of story in question, feel intangible, almost alien to me – though I can well believe to the author and a subset of readers it has acute meaning. And that’s not only fine, it’s essential to these works and the reason I read them. This effect is often size, or scale of a less literal kind, and the understanding that ‘it’ is beyond my ability to comprehend or visualise. It’s awe. 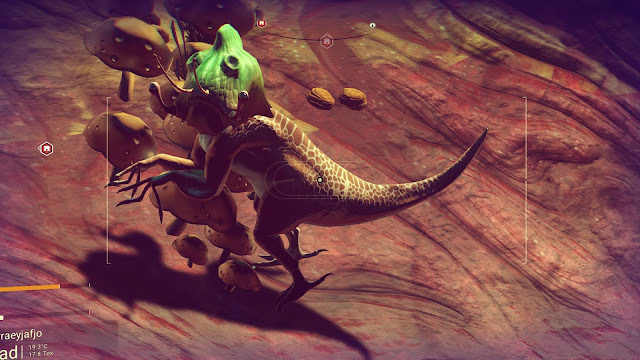 No Man’s Sky delivers this same effect, but does so in a form only videogames are currently capable of. I believe that to be a huge achievement, for the developers, a triumph for the medium. 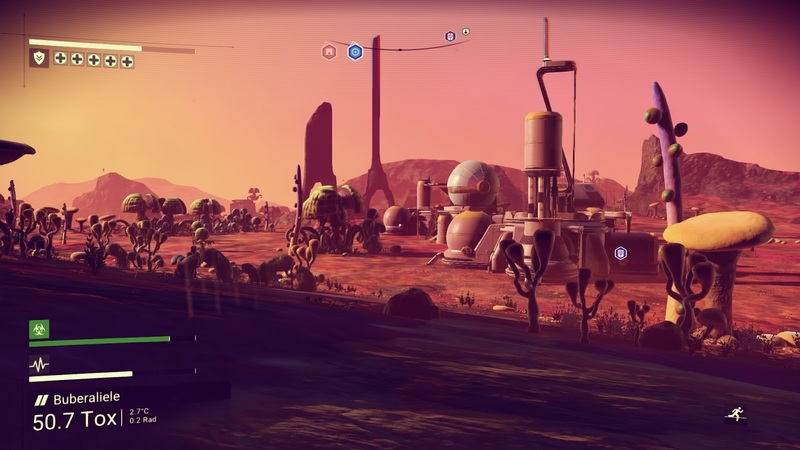 The literal unimaginable scale of No Man’s Sky’s universe is achieved through procedural generation. The result is that every planet I’ve visited has been unique, in terms of geology, atmospherics, flora, and fauna. Now, we must not confuse what is for all intents and purposes infinite generation to be infinite assets, or infinite possibilities. You’ll see the same mushroom stalks; they may be different sizes, colours, certainly with different names, but the base asset will appear many times. There are a lot of assets however, but it’s really down to the laws of probability to determine the variation in what one might see. And let us not understate the wildlife, whose physiologies combine many different types of assets, often combined to great comic effect – I’ve seen shades of dog-creatures that no human mind could have conceived of. What you are doing has a defined scope; it is a light survival game, so a reasonable percentage time will be spent mining, crafting, and topping up meters. But it is also a light space simulator, featuring trade and space travel. Neither is what this game actually is however, no more than every first-person shooter with RPG elements is an RPG. It is a piece of science fiction, to ascribe a genre would be to mislead, I might even take umbrage with the descriptor of ‘discovery’, because again, the literal discovery mechanics are only an element of the whole. What I believe No Man’s Sky to be, is an experience far more personal. While there is a narrative of sorts, and context through terminals belonging to the game’s sentient species, the story is entirely your own. There is no authored arc, no point at which you really triumph, indeed no point at all. Again, it is very much that kind of science fiction, the ‘point’ is for you to experience it, that is all, and that won’t be enough for every player. As I mentioned earlier, discovery is one of the element in No Man’s Sky, mechanically this is facilitated through the scanning of flora and fauna, and the learning of alien languages – you also discover star systems, planets, and location by simply visiting and activating beacons. You use a binocular equivalent to scan organics, like locations these discoveries can be renamed and uploaded. Language is a little different; by interacting with monuments and terminals, you learn alien words, which are translated automatically when you communicate with the aliens. It is the discovery elements that I found most appealing – even though I have never once taken the time to rename anything – being mechanics of learning rather than combat or progression. The latter systems hold little value for me, and the survival and crafting is busywork, as it is in most games it appears in. Yet all are light enough here that they didn’t frustrate, on the other hand, players with a hunger for these mechanics will likely find them lacking. For example, the combat, in space and on land, as a depth roughly comparable to that of Arthur C Clarke’s Commander Norton (Rendezvous With Rama) – which is to say its shallow. No Man’s Sky is an achievement worthy of respect I believe, regardless of whether or not it is a ‘good game’ in the traditional, broad meaning of the term. And that the achievement is not just one of engineering, but also of design and vision, of that I feel most passionately. 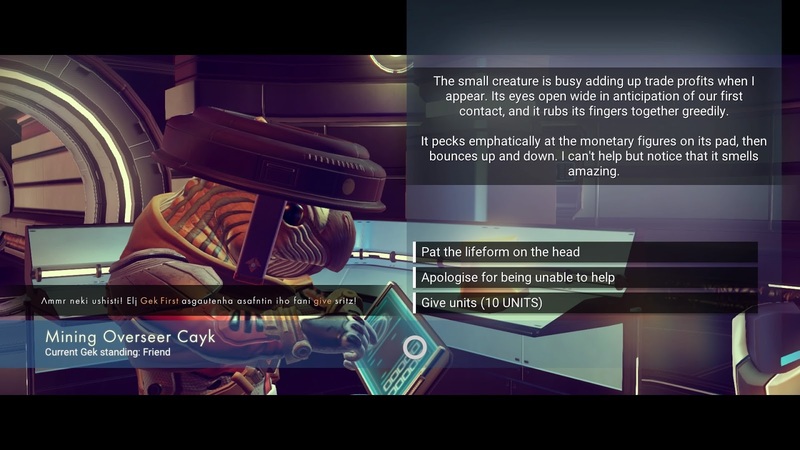 No Man’s Sky achieves in videogame form, that heart-soaring sense of wonderment, ignorance, and unfathomable scale, very much in the style of the hard science fiction greats. But like so many novels of that calling, ancillary elements have not been developed quite so thoroughly; they do little to diminish the work in my eyes however, for they are not core to its effect. If I had to craft more than I did, or learn more complex combat systems, I would be doing more ‘playing’ and less seeing, less not understanding. Of course, more diverse flora and fauna, and planetary compositions would doubtless further the sense of wonder, yet even as I write that I must laugh, for there are more planets than I could ever visit, more worlds than I can ever imagine. Who can say what I might yet find between those beautiful stars?